Jason A. Crotty is a birder and lawyer living in Portland, Oregon who has been sharing some thought-provoking pieces with 10,000 Birds readers. Jason’s first contribution tackled the importance of the National Wildlife Refuge System, while his second took a deep look at how many birders there really are. Wind energy is an alternative to burning fossil fuels to generate electricity, but there are consequences to the environment and, in particular, to birds. For example, turbine blades can be lethal to raptors, particularly eagles. 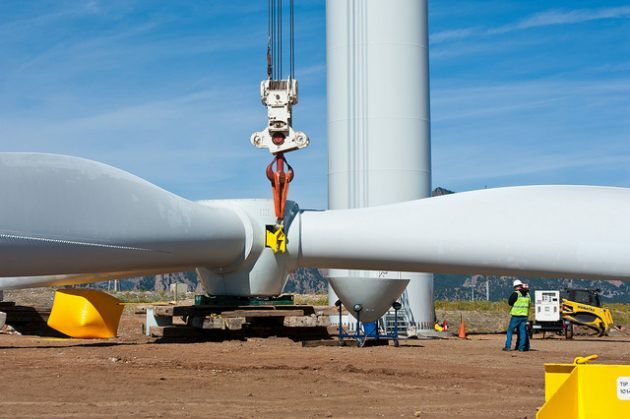 Additionally, some of the best locations for wind farms are sensitive habitat and turbines must first be constructed and then maintained, which requires roads and other infrastructure. Moreover, the power lines needed to transmit electricity from the remote locations where it is generated to the urban locations where it is used can further impact habitat. The result is often litigation, frequently lawsuits initiated by conservation groups. An occasional look at how these cases actually proceed can be interesting and informative to the conservation-minded birder. The U.S. Court of Appeals for the Ninth Circuit recently decided a case about whether a wind energy facility could be constructed in remote southeastern Oregon, in Greater Sage-grouse habitat. 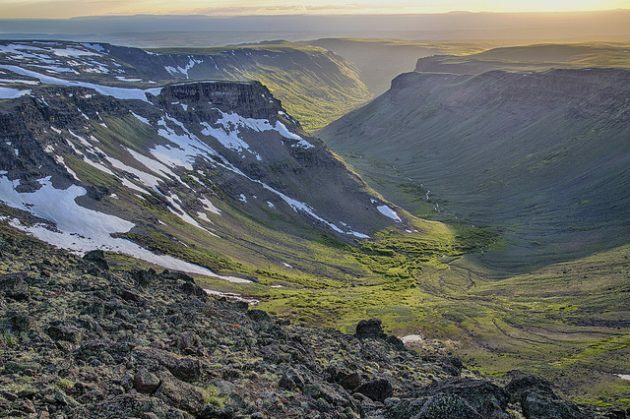 The case involved the Echanis Wind Energy Project, a planned 104-megawatt facility consisting of 40-69 turbines that would be located on Steens Mountain in Harney County, Oregon. Although the land on which the facility would be constructed is private, the necessary transmission lines would cross land administered by the Bureau of Land Management (BLM). As a result, the entire project was subjected to the National Environmental Policy Act (NEPA). NEPA is a federal law that requires agencies to follow certain procedures before commencing a project. One of the most important steps is the environmental impact statement (EIS), which considers a project’s environmental impact, alternatives, and potential mitigation efforts. NEPA is a procedural requirement, meaning the process must be followed, but no particular outcome is mandated. The goal is informed decisionmaking by the agency. 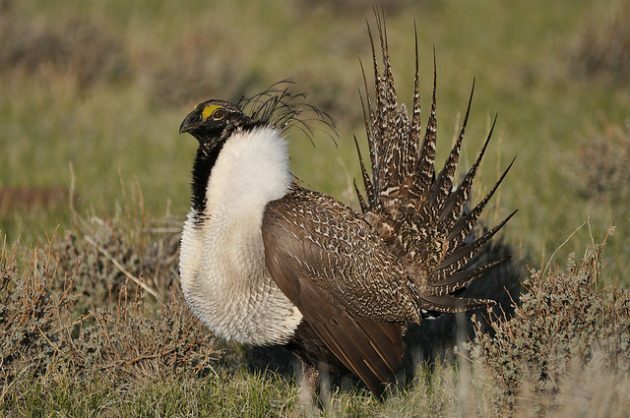 The most important issue in the EIS was the Greater Sage-grouse. 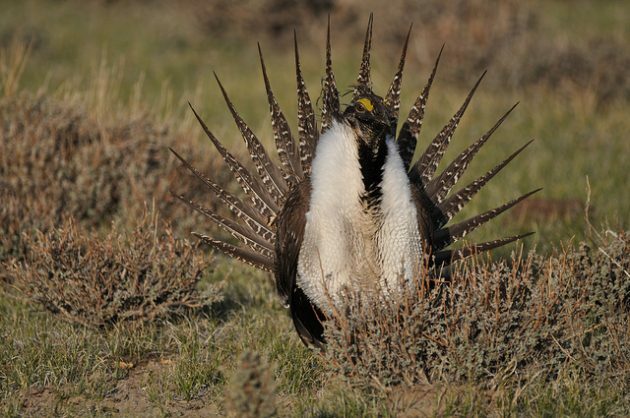 The grouse needs sagebrush year-round, but particularly for winter when sagebrush leaves are its only food. But in winter, only some sagebrush habitat is exposed, i.e., not covered by snow, and therefore available to the birds. Such habitat is considered particularly important and it is given the highest priority under Oregon’s sage-grouse management plan. Although it did not actually survey the facility site, BLM extrapolated from two nearby sites and inferred that the grouse was absent in winter. 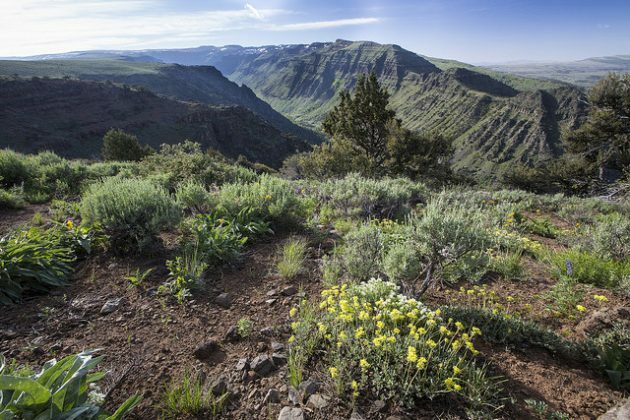 When BLM approved the project, the Oregon Natural Desert Association and the Audubon Society of Portland filed a lawsuit in federal district court contending that the BLM decision was improper. The conservation groups raised a number of arguments, but the court ruled against them and in favor of BLM in every instance. Agency decisions are typically entitled to deference by courts, meaning an agency decision is presumed correct and the challenging party has a high burden to show that the decision is clearly wrong. In legal parlance, the party must show the decision was “arbitrary, capricious, an abuse of discretion.” Deference is particularly appropriate when an agency is making scientific or technical judgments within its area of expertise, as in the case of land management by BLM. The judge determined that BLM collected sufficient data and made reasonable decisions based on that data, finding the BLM’s actions were not arbitrary and capricious. The conservation groups appealed to the Ninth Circuit. On appeal, the conservation groups argued that BLM failed to assess “baseline conditions” at the site by doing an actual count rather than an extrapolation from nearby sites. Although a baseline is not itself a requirement of NEPA, the court stated that it was a “practical requirement.” Without a reasonable baseline, the court reasoned, there was no way for BLM to assess the project’s impacts and, therefore, no way to assess alternatives or mitigate any adverse impacts. Thus, the court held that BLM had a duty to assess the actual site. Additionally, the court stated that several sage-grouse were found at one of the nearby locations during a winter survey. Given that, the inference should have been that grouse were at the site during the winter. Moreover, BLM’s consultants suggested that the site was good winter habitat for the grouse and stated that an actual survey should have been conducted. Nonetheless, errors are not fatal if they are “harmless.” But the court found that the inadequate winter baseline analysis “materially impeded informed decision making and public participation.” Moreover, if there are wintering grouse on the site, the site would be critical habitat under the Oregon sage-grouse management plan. Such habitat is deemed irreplaceable and cannot be destroyed because mitigation is inadequate. Thus, the court reversed BLM’s lower court victory. The consequence is that the project will either be delayed or abandoned, as it appears that BLM will have to conduct a thorough winter grouse analysis at the site if the project is to move forward. The developer will also have to assess its options in light of the decision by the Ninth Circuit. Judicial decisions such as this do not turn on abstract weighing of the relative importance of birds and renewable energy. Rather, they turn on glamourless issues of administrative law, namely whether an agency followed the proper procedures and made reasonable decisions after considering all of the information it obtained. There will continue to be conflicts between renewable energy facilities and birds and their habitats, as each is important. Although these lawsuits can be opaque, they do have an impact. Photos: Greater Sage-grouse: Jeannie Stafford/USFWS; Steens Mountain Cooperative Management and Protection Area: BLM. Thank you for a very well written, and informative story. Having grown up in that very area, I appreciate “news from home” so to speak. I have worked with, and for the BLM twice on Environmental Impact Statements back in the late 70’s, and have seen how easily data can be found, or ignored in order to find the correct answer the project requires. Again, thank you for some great information!